How to Protect Your Appliances from a Power Surge | Hi-Lite Electric Inc. Given the limited ability individual surge protectors have to fully protect your appliances and electronics, you may want to consider having an electrician install a service entrance or breaker box to protect all home appliances and electronic devices. There are also snap-in protectors that take two breaker spaces. Bear in mind that the snap-in protector usually fits only in the service entrance or breaker box from the same manufacturer. Sometimes, it must match the exact model and time period of the breaker box itself. Furthermore, the front panel on the service entrance must be removed to install a snap-in protector. The main breaker to the house must be turned off before this is done. It is safest to hire a licensed professional to address any service-panel protectors you want installed. Additional types of surge protectors are designed for wiring directly into the service entrance or panel. Others are intended for direct wiring next to the panel. A licensed professional is your best option for handling that type of work. Some city codes do not allow the homeowner to do any service box wiring of any type, so a professional is required to install or modify any wiring related to the service entrance or box. Some cities or municipalities all a special adapter containing a surge protector to be installed outside your home between the meter and the socket. This must be performed by a professional and requires the power company’s co-operation if they allow this type of device at all. Telephone, cable, and satellite wiring should have the same grounding point. When possible, have a professional electrician install surge suppressors at the point of highest exposure, where the power enters your home. 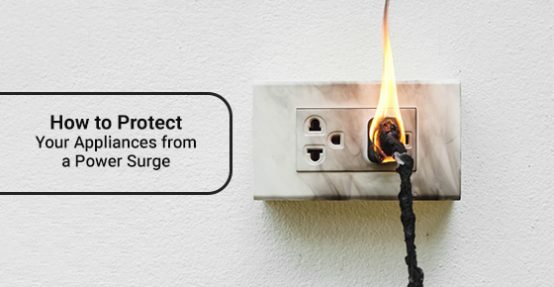 Surge suppressors can provide a good defense against lightning surges, power grid switching, brownouts or blackouts, severe weather problems, and power system failures. Occasionally, you can have an additional defense against power surges by installing a surge suppressor at the service panel. In larger homes, it may be necessary to install more than one surge suppressor, especially when cable, antennas, power and telephone lines and wires are installed at opposite ends of the house. This often results in one or more lines not being grounded properly. A professional from an electric services company can determine when this occurs and can correct the issue before it becomes a major problem. Not only does an unplugged electrical device prevent its potential contribution to power surges, but it also saves electricity consumption and can lower your utility bill. An easy way to accomplish this is to plug your devices into a power strip and simply switch the power strip off at night when you are leaving the house or any other period of time when those devices will not be in use. If your power strip has most or all of its slots filled with plugs, consider what equipment or devices are fully charged and no longer need to stay plugged into the power strip. Do not be afraid to unplug most electronic devices. Too often it seems easier to leave your mobile phone plugged in for fear it might power down. Put it in battery save mode and unplug the charger from the outlet or power strip. Many people assume that a charger with no device connected consumes no power. This is incorrect thinking. Electricity still flows through that unit ready to instantly begin charging any device as soon as its attached. Some chargers heat up whether they are in use or not. This is highly dangerous, as your electronic devices normally are not intended to produce heat, and because the heated device causes heat to build up in the outlet, resulting in a meltdown, a house fire or both. In underpowered homes running the microwave and the toaster together from the same outlet will cause a power surge and a tripped circuit breaker. Cyclical devices such as refrigerators and air conditioners are known to cause power surges when both cycle on at the same time. Both examples above are more than capable of causing a house fire. Lightning causes power surges. While power strips may help mitigate damage from many power surges, they are no competition for a lightning bolt nearby. Hi-Lite Electric has the professionals to assess your home’s safety. You can call us at 416-800-5523 or contact us here.